In the book "Justice: What's The Right Thing to Do?" 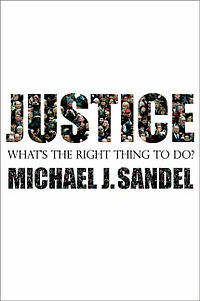 (Sandel 2010) Michael Sandel aims to help us answer questions about how to do the right thing by giving some context and background in moral philosophy. Sandel is a philosopher based at Harvard University who is reknowned for his popular treatments of the subject. He starts by illustrating decision making through the 'trolley' problem. 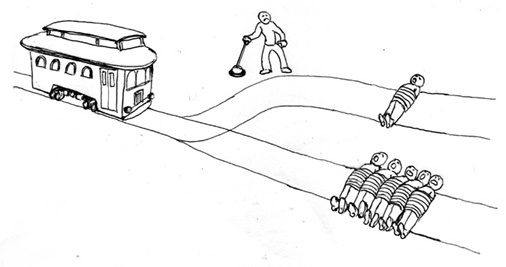 Figure: The trolley problem in its original form. Daniel Kahneman's Nobel Memorial Prize in Economics was awarded for the idea of prospect theory. Kahneman describes the theory and its background in his book, "Thinking Fast and Slow" (Kahneman 2011). Empirical theory about how people are responsive to change in circumstance, not absolute circumstance. Bentham's ideas focussed around the idea of a global utility. Without variation, there is no separation between effective and ineffective strategies. those due to insufficient data to underpin a complex model (variance error). Use more complex models and average. Helper function for sampling data from two different classes. Helper function for plotting the decision boundary of the SVM. """Plot the decision boundaries for a classifier. :param axs: the axes to plot on. :param y: target training data"""
# Create an instance of SVM and fit the data. # Set-up 2x2 grid for plotting. Figure: In each figure the more simple model is on the left, and the more complex model is on the right. Each fit is done to a different version of the data set. The simpler model is more consistent in its errors (bias error), whereas the more complex model is varying in its errors (variance error). In a population we should prefer variance-errors. Bias errors lead to consistent, decsion making. Sustain a variety of approaches to life. Complex explanations such as half-time football punditry. Also clinical experts (Meehl 1954). Meehl suggested they 'try to be clever and think outside the box'. Not OK for the human race. Animals in a species become too specialised then they may not be able to respond to changing circumstances. Think of cheetahs and eagles vs rats and pigeons. I may not agree with many people's subjective approach to life, I may even believe it to be severely sub-optimal. But I should not presume to know better, even if prior experience shows that my own 'way of being' is effective. Variation is vitally important for robustness. There may be future circumstances where my approaches fail utterly, and other ways of being are better. Quality of our individual subjective utilities measured by effectiveness. But it is survival of entire species that dominates long term. A universal utility by which we are judged is difficult to define. Trolley Problem is an oversimplification. What if remaining deaths are all cyclists? The marvel of evolution is its responsiveness. Utility function evolves socially and in our environment. There is only one absolute policy we should follow. Since all models are wrong the scientist must be alert to what is importantly wrong. It is inappropriate to be concerned about mice when there are tigers abroad. 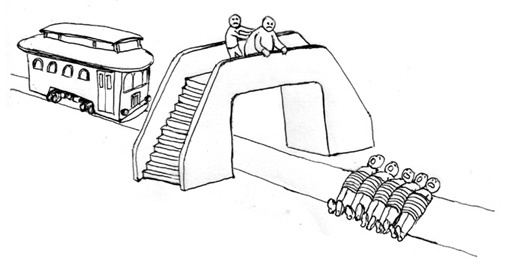 Figure: The original trolley problem. The decision is deterministic. The second example is largely contrived, and riddled with uncertainty. Figure: In the situation where you push an overweight gentleman, the decision is riddled with uncertainty. Doubt inevitably creeps in. Box, George E. P. 1976. “Science and Statistics.” Journal of the American Statistical Association 71 (356): 791–99. http://www.jstor.org/stable/2286841. Breiman, Leo. 1996. “Bagging Predictors.” Machine Learning 24 (2): 123–40. doi:10.1007/BF00058655. Geman, Stuart, Elie Bienenstock, and René Doursat. 1992. “Neural Networks and the Bias/Variance Dilemma.” Neural Computation 4 (1): 1–58. doi:10.1162/neco.1992.4.1.1. Kahneman, Daniel. 2011. Thinking Fast and Slow. Meehl, Paul E. 1954. Clinical Versus Statistical Prediction: A Theoretical Analysis and a Review of the Evidence. Sandel, Michael. 2010. Justice: What’s the Right Thing to Do?